There are few issues in the environmental movement as polarizing as nuclear power. On one hand, nuclear provides a huge, baseload energy source that has no real carbon footprint. On the other hand, it’s easy to see why people are against it: just this week a senior nuclear expert advised that California’s nuclear power plant should be shut down, and the ongoing news about the effects of radiation in Fukushima is scaring people off using nuclear energy altogether. Add to this all the pro- and anti-nuclear lobbying that takes place, and the topic becomes incredibly confusing, so I’ve broken down the key facts for you here. 1. Is nuclear power safe? There is no clear answer to this question because we can only speculate on how probable or improbable it is that an accident with nuclear technology will occur. It’s true that increased safety regulations and monitoring and modern technology make nuclear power safer than it has been in the past, however even the most stalwart pro-nuclear proponent has to admit that there is still a risk involved with using nuclear power. The problem is that this seemingly small risk has the potential for extremely large and irrevocable consequences, as is currently being demonstrated in Fukushima in Japan, where a powerful earthquake in 2011 caused a nuclear meltdown. Another thing to think about is seismic activity and the potential effects of this on nuclear power plants, particularly since fracking wells have been linked to increased seismic activity even in areas with no history of earthquakes pre-fracking. This is why Michael Peck, a senior federal nuclear expert, is urging regulators to shut down the last operating nuclear power plant in California until they can assess the potential impact of earthquakes on the facility. In the same report Peck also states that the Nuclear Regulatory Commission has not been sticking to the safety rules it outlined for the plant’s operation. Earlier this week the Nuclear Regulatory Commission approved storing nuclear waste on-site for 160 years or more after a reactor has shut down, to much criticism from anti-nuclear activists and local residents, however in the absence of waste burial sites this is the only answer while the nuclear waste is being produced. In May this year, Forbes reported that a small release of nuclear radiation that occurred on Valentine’s Day was probably linked to ‘the wrong kitty litter’ which was used to treat some of the nuclear waste that had been stored in WIPP, the world’s only underground nuclear waste repository which is based in New Mexico. Whatever your views on the safety of nuclear power, it’s worth keeping in mind that as late as May this year four nuclear reactors in northern England had to be shut down due to faults. Granted, the faults were picked up on before disaster struck. But is that a risk we’re willing to take? Let’s look at the other issues in the debate to see whether the pros outweigh the cons. 2. Is nuclear power clean or sustainable? This is the most confusing element of the nuclear energy debate because opposing parties can so easily use the term ‘sustainable’ to justify their own arguments. Again, the issue is more complex than that. Yes, nuclear power is more sustainable than coal, because nuclear reactors do not emit greenhouse gasses during operation, whereas coal is extremely polluting and there is wide recognition that we need to wean ourselves off it altogether. However, nuclear energy is not sustainable in itself. There is a critical issue that determines the argument here which is that nuclear power creates radioactive waste that is highly toxic, and we currently have no long-term plan for dealing with it. Some of the waste is recycled and disposed of safely, but the matter that’s left over is worryingly dangerous and we still don’t have a way of safely disposing of it. What we currently do is lock it in cement or steel casks, and store it in pools for a few decades, or bury it underground and hope for the best. We don’t know what the effects of all this buried material might be in the long-term and we don’t seem to be any closer to finding safe ways of storing the leftover waste forever. Because of this issue of toxic waste, it cannot be argued that nuclear energy is sustainable, and it means that nuclear energy is the very opposite to the definition of clean. Consider it this way–nuclear waste has a half-life that is longer than any language every known to exist. If we put safety warnings and handling procedures in English, Cantonese, and Spanish, but will any of those languages still be used in 10,000 years when future generations open nuclear storage facilities? The only answer we have to that question is that we don’t know. 3. Is nuclear power the key to energy independence? Thankfully there is another energy option available that could replace our need for oil. Read on. 4. 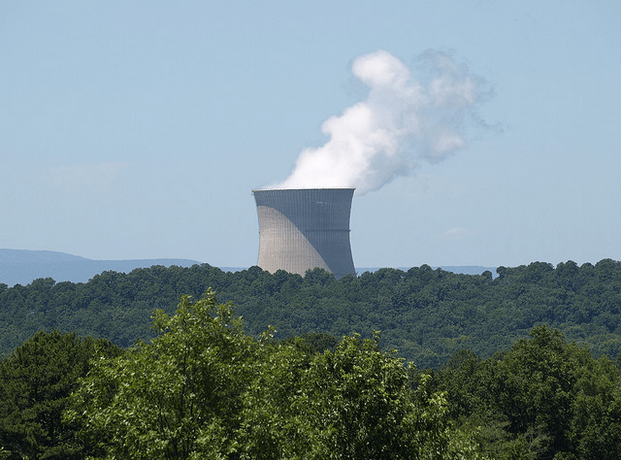 Is nuclear power the only viable option? As politicians continue the global discussion of attempting to stop or slow climate change they tend to loop from coal to nuclear and back again – even though neither is the truly sustainable option here. As some wise individual put it, there aren’t huge profits in ‘free’ energy, ie renewable energy that cannot be owned and co-opted by a single company. Once you invest in the initial equipment for harnessing solar, water or wind power, you don’t have to pay an energy provider for your “fuel” needs for the rest of your life, and some environmentalists argue that this is why governments deliberately choose not to invest in renewable technology. Certainly the question has to be posed as to why we discuss the nuclear option at all when we could be discussing the low carbon option of renewable technology. Renewable energy does not create hazardous waste material that we are unable to deal with, does not require mining, and it isn’t about to run out any time soon. Most importantly, it is the best option for the environment because of the low emissions involved with obtaining it, and 97% of scientists agree that we need to act on emissions now to help stop or slow climate change. Since a third of Britain’s nuclear capacity went offline in the week that energy provider EDF found faults in its nuclear reactors, it’s clear that we need to switch to a safe source of energy that can, at the very least, tide us over in emergency situations like this one. It’s hard to see why governments around the world aren’t heavily investing more in renewable energy technology already – although some are doing so, the financial amounts are miniscule compared with fossil fuel subsidies that are already in place. In the past the main barrier to solar investment has been limited battery energy storage, but this technology has come far in recent years – read up on the perovskite lightbulb and see for yourself. However, real investment is required to make renewable energy a viable contender for energy, and one has to wonder why we aren’t seeing more of that yet, when the need for fossil fuel replacement is so urgent. As you’ve seen, there are no clear or easy answers in this debate, so I’ll leave it to you to decide what you do with this information. I will conclude by pointing out that even being pro-nuclear energy doesn’t mean that you have to be anti-renewable energy. Why don’t we start investing in renewable energy anyway? We have nothing to lose, and much to gain.